Hi Pete, any pics of the engines. What type ? I'm guessing Chi-Com Blue Max's. Year back a guy was talking about powering a Series I with some Honda GX-160's or 200's ? Never heard anything more about it. I recall the guy saying the engines could be lightened somewhat by modifying the case, pull start, muffler..ect. FYI, I've run one of the Chinese made 5.5 hp Robin Subaru clones WOT at full load for over 25 hours (after a one hour break in) with no problem. Seemed to get stronger as it ran. It's attached to a 2" trash pump. I just bought a similar 6.5 hp engine (as in it looks identical) from Horrible Freight on sale for $100! Cheaper than rebuilding a old crummy Tecumseh engine I have. Too bad it weighs over 35 pounds. I would guess mounted up on a nacelle with prop would put it at around 50 pounds...or about twice what a Rotax 185 set-up runs. 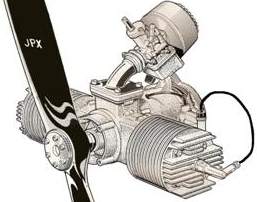 With it's peak power atleast 1500 rpm lower than that of the Rotax, it would buy you some additional prop efficiency (but unfortunately a heavier prop). Pete showing his test stand to Lynn and Lorne. Day before yesterday I was test running a low time 185 on the stand with wood P-tip. Man that sucker was just flat-out getting it at 100% ! Smooth and strong ! Looking at it objectively the 185-P-tip combo is just SUPER SWEET all things considered ! 34lbs complete, super reliable, extremely durable, and good fuel burn too. I don't have anything against the 185s, in fact mine are now in top shape...new bearings and seals, and electronic ign. and have real good power, and likely good now for maybe all the flyin I have left in me, but I think a guy with a crapped out engine looking for an inexpensive alternative, this could be an option....I think 500 bucks would do the engine and put the new prop and hub on it also....this engine will likely run a ptip up to speed too,but I opted to drop the rpm down to the early 4000's.....it will spin a 31x12 at 5050 rpm. I've not flown with the p tips but I've heard them run and they sure are sweet...the props I have on my rotaxs are 31x12 wood made by John Clark in Tottenham Ont....They are noticably quieter than the bi props and a fair bit more efficient too. I don't think the weight of the 6.5s is going to be an issue ...the bare motor is 28lbs on the br scale, then the hub and prop and whatever kind of muffler I'm going to put on...I'm getting the engine mounts finished tomorrow...3 or 4 lbs maybe, and then the nacelle what ever it weighs....Don't think it will be over 40lbs hope not anyway....I'll weigh it for sure and let the group know. Hi Pete, looks pretty good so far. Holding the weight down and increasing RPM is pretty critical with the project I'd think. Really don't want to end up with the weight of 20hp JPX's with a lot less power. Tyler what do the JPX's weigh and what thrust numbers are you getting ? One thing I noticed on the GX 200 page was a Tillotson carb. Now that would maybe be the ticket. Could that be used on your clone motor with a V-stack ? Also looks as though the motors can be purchased with different degrees of modification to up the horsepower. Would a guy in the end maybe be better off to start with an already modified Genuine Honda. $400 gets a basic modified Honda. The Package 3 Clones are boasting 12+Hp and 6500rpm are only $450 too. Why not start out with one of these. Is it simply a matter of testing with a cheap engine and later upgrading to the engines with upgrade parts and increased power-revs. Things have come a long way fast with these engines. Definitely surprising what they can do ! Do you have a link to your thrust calculator ? wow, an optimistic message from shannon about new lazair engines? i knew it was cold in hell lately but didn't know it had frozen over!!!!!!!!!!! seriously though, if you can't find a nacelle to buy i will loan you one for your testing, just let me know. My JPX weighs 45 pounds loaded up with nacelle, exhaust and all - it puts out 85-90 pounds of thrust measured by spring scale on groovy test stand daffy built.